Today we begin a novena to Our Holy Father, whose feast day falls next Friday. How wonderful it is, too, that we shall also be starting the novena to the Holy Ghost in preparation for Pentecost tomorrow, too! In Chelmsford, we are praying the novena to Norbert after every Mass, and reciting the litany of St Norbert after vespers, until his first vespers. They are published below to allow you to join with us in prayer. O holy St Norbert, gentlest of saints, your love for Jesus Christ truly present in every tabernacle around the world and your charity for souls made you worthy while on earth to possess miraculous powers. Miracles waited your word, which you were ever ready to speak for those in trouble or anxiety. Encouraged by this thought, I implore you to obtain for me the favour I seek in this novena. The answer to my prayer may require a miracle; even so, you are the saint or miracles. O gentle and loving St Norbert, whose heart was ever full of zeal for souls, whisper my petition into the ears of the Infant Jesus, on Whose birthday you founded the holy Order of Prémontré, and the gratitude of my heart will always be yours. God, the Son, Redeemer of the world. Holy Mary. Pray for us. Queen of the white-robed Order. Holy Virgin, who hadst a great love for St Norbert. St Norbert, whose birth was foretold from Heaven. St Norbert, who was marvellously converted by God. St Norbert, mirror of true penance. St Norbert, who didst trample earthly pomps under foot. St Norbert, despiser of the world. St Norbert, who didst conquer thy passions and affections. St Norbert, who didst gain the victory over temptations. St Norbert, who didst quell and cast down devils. St Norbert, restorer of peace and concord. St Norbert, who didst walk barefoot. St Norbert, who didst practice mortification. St Norbert, lover of the Cross. St Norbert, pattern of abstinence. St Norbert, who didst receive the white habit from the Mother of God. St Norbert, most constant in faith. St Norbert, most firm in hope. St Norbert, most fervent in charity. St Norbert, zealous lover of chastity. St Norbert, model of poverty. St Norbert, mirror of obedience. St Norbert, vigilant teacher of discipline. St Norbert, defender of the true faith. St Norbert, choice vindicator of the Blessed Sacrament. St Norbert, pillar of the Catholic Church. St Norbert, light of prayer and contemplation. St Norbert, leader of the white-robed army. St Norbert, patriarch of the Premonstratensians. St Norbert, father and protector of thy Order. St Norbert, Primate of Germany. St Norbert, worker of miracles. St Norbert, wonderful discerner of spirits. St Norbert, imitator of Jesus Christ. St Norbert, follower of the Apostles. St Norbert, who was like to the martyrs. 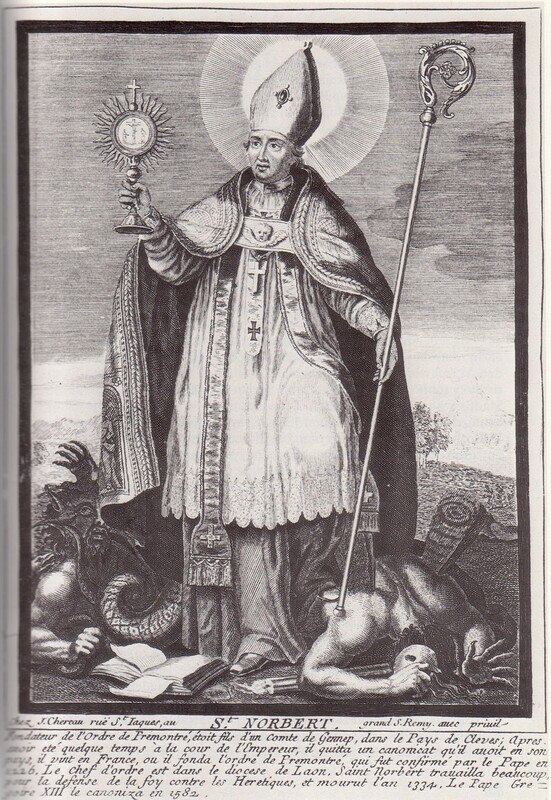 St Norbert, gem of pontiffs. St Norbert, glory of confessors. St Norbert, companion of virgins. St Norbert, colleague of all saints. From the neglect of Thy commandments. Deliver us, O Lord. From the transgression of our vows. From uncleanness of mind and body. From a proud and sad spirit. From the disorder of our passions. From the blindness of self-love. From the obstinacy of self-will. Through the wonderful conversion of St Norbert. Through his ardent zeal in preaching. Through his glorious crown in heaven. Through his merits and intercession. We sinners. We beseech Thee, hear us. That Thou wouldst grant us true sorrow and contrition of heart. That Thou wouldst grant us true conversion of life. That Thou wouldst grant us obedience to our Rule and preserve us in the same. That Thou wouldst make faith, hope and charity to grow in us. That Thou wouldst make us zealous observers of our holy vows. That Thou wouldst grant us the gift of prayer. That Thou wouldst bestow upon us the seven gifts of the Holy Spirit. That Thou wouldst vouchsafe to govern and preserve Thy holy Church. That Thou wouldst vouchsafe to extend and preserve the Premonstratensian Order. That Thou wouldst vouchsafe to strengthen the Abbot-General and all the prelates of the Order with perfect spirit. That Thou wouldst vouchsafe to grant us the crown of perseverance. That Thou wouldst give grace to the living and to the departed eternal rest. Lamb of God, Who takes away the sins of the world. Graciously hear us, O Lord. Lamb of God, Who takes away the sins of the world. Have mercy on us. V/ Pray for us, O Holy Father Norbert. V/ O Lord, hear my prayer. R/ And let my cry come unto Thee. O God, Who didst make of Blessed Norbert, Thy Confessor and Bishop, an excellent preacher of the Word, and by his means didst enrich Thy Church with new offspring, grant, we beseech Thee, that through his intercession we may put in practice by Thy grace what he taught us, both in word and work. Awake, O Lord, in Thy Church the Spirit by Whom St Norbert, Thy Confessor and Bishop was guided, in order that, filled with the same spirit, we may love what he loved and live as he taught us. O Lord, grant to us Thy servants constancy in Thy faith and service, that, rooted in Divine Charity, we may not be conquered by any temptation. Through Christ our Lord. Amen. Praised be the Blessed Sacrament of the Altar and the Immaculate Conception of the Blessed Virgin Mary. Amen.